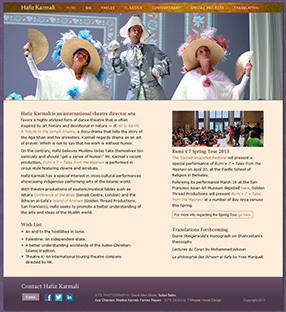 The websites listed here provide a sampling of website projects from Incite Design. 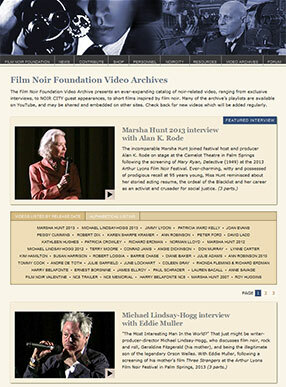 Along with continually updated projects like The Film Noir Foundation website, be sure to check out Mid-Century Productions,Hafiz Karmali.com, VerPlanck Consulting and Transatlantic Habit. Mid-Century Productions  Mid-Century Productions programs "mini film festivals" screening rarely seen international films from cinema's most explosive three decades—the 1940s, 1950s, and 1960s. In July of 2018, Mid-Century presented MIDSUMMER NIGHTMARE at San Francisco's Roxie Theatre with two films featuring French film noir's "Goth girl" Andrée Clément. In November the fifth edition of Mid-Century's popular French noir festival, THE FRENCH HAD A NAME FOR IT, returned to the Roxie with 20 films from 1949-1959 from the "lost continent of French film noir." With its mission to rescue and restore classic noir films, the Film Noir Foundation annually presents NOIR CITY, one of San Francisco's most popular film festivals held at the landmark Castro Theatre. 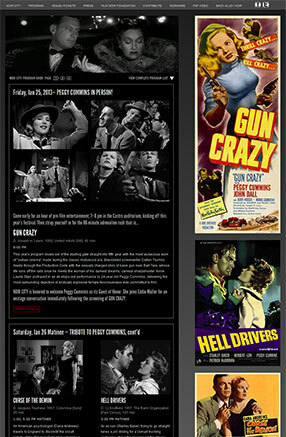 NOIR CITYprovides program, ticketing, and press reviews, archived past festival coverage, as well as an online store. 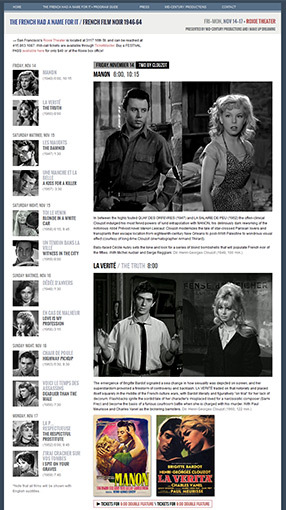 FilmNoirFoundation.org provides a resource for noir film aficionados,film and festival news incoporating the FNF's live Twitter feed, tv listings,online donation, and an expanding collection of exclusive video interviews in itsVideo Archives areastreamed from itsYouTube channel.The site provides essential outreach for fundraising the Foundation's successful preservation efforts, integrating PayPal andAWebermailing list integration, and supporting the Foundation's subscriber-based quarterly NOIR CITY e‑mag. HAFIZ KARMALI  International Theatre Director. With extensive photo and video imagery, the site presents the colorful and creative work of Hafiz Karmali, known for his highly stylized form of dance-theatre inspired by art history and devotional in nature. VER PLANCK CONSULTING  Historic Preservation Consulting provides a full range of architectural history and preservation consulting services in the San Francisco Bay Area. The Friends of 1800 has focused on the preservation of significant historical buildings, landmarks and the architectural heritage of San Francisco. Their website documents the group's advocacy work beginning in 1997 to block the demolition of the Fallon Building, since incorporated into the SF LGBT Center. The site provides a complete list of SF Landmarks and Historic Districts, as well as updated news on San Francisco's moviehouses. TRANSATLANTIC HABIT  Translation services, published and unpublished literary fiction by Marc Svetov and Petra Schreyer in German and English, including writings on film noir. THE JA YELLOW PAGES  A searchable community directory of nonprofit organizations serving the Japanese-American communities throughout North America, including post-Fukushima fundraising efforts. The site implements Mosets Tree's unrivaled directory component software in Joomla CMS. California Japantowns represents the first statewide project to document historic resources from 43 pre-World War II Japantowns as well as existing Japanese American communities. Sponsored by the California Japanese American Community Leadership Council, the site includes Preserving California Japantowns' extensivesearchable databaseof more than 3,000 locations with Google map integration.